US Blind Tandem Cycling Connection Endorsed Us! Check out this blog: here. 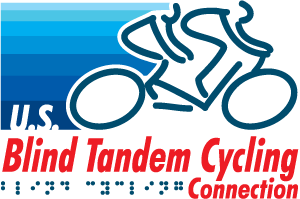 We're building a relationship with the US Blind Tandem Cycling Connection, a non-profit organization with a mission to "increase the participation of individuals who are visually impaired or blind in the exhilarating sport of tandem cycling." It's awesome what they're doing, and we totally support them! Please check out their website and share with anyone you know who could benefit from such an organization ...or who could help by captaining a tandem for them. For now, we're able to ride on our own ...but soon, good 'ole Captain Tauru will be in the stoker seat, too. Check them out at US Blind Tandem Cycling Connection.